How do we debug ourselves as human beings? I went to BIL yesterday, it’s an “unconference”… a bit like TED, but less official and much cheaper. In other words, how can we use technology to observe ourselves, make recommendations and change our behaviours. Now I realise this whole self-improvement is probably in the realm of navel-gazing … but bear with me. I was so inspired by the talk that I did a little experiment. One of the things I’ve done for the past year, is make notes using Google Keep. Whenever I’ve had a thought, idea, or hear something profound – I make a note using the app on my phone. Think of Google Keep as a catalogue of your brain’s thoughts. 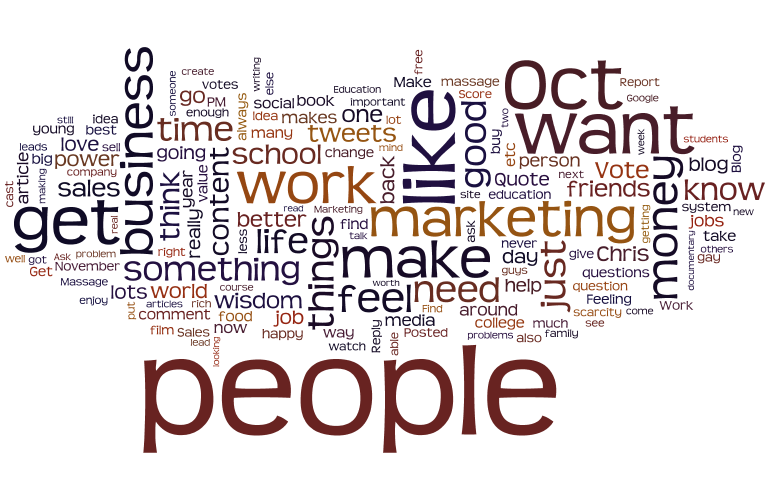 I then used Wordle to create these word clouds. The following data is based on over 28,000 words in ~1000 notes I’ve tapped into my phone. This second one, below focuses on Boxing Day 2013 to 2 March 2014 (today). Most of which I spent in San Francisco. Now – what can we gather from this semi-scientific experiment? 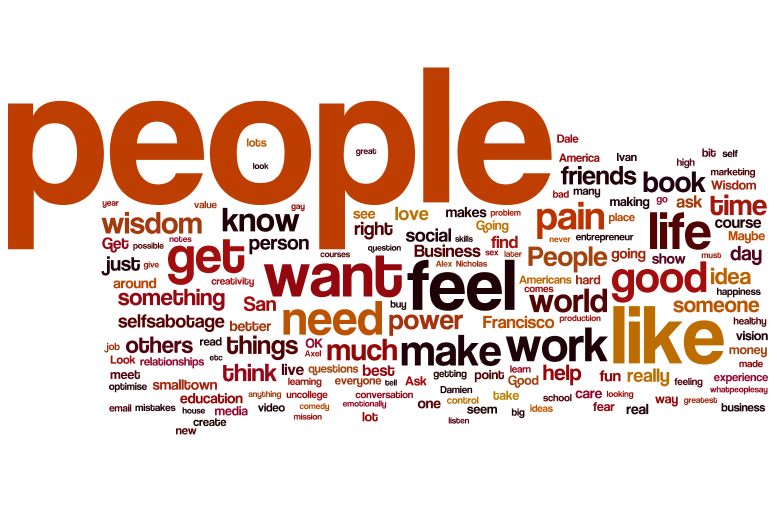 I think about people, and how humans work, a lot. I’m only scratching the surface here of what could be done. But the ramifications of this are if you log your thoughts during the day, you have a good data set. Once you have a dataset, you can analyse it and realise your behaviours and patterns. Based on those patterns and behaviours, a computer-system could make recommendations. And the ultimate result of this means we can debug ourselves as human beings. It’s a very geeky thing – what I’m going to say next, but it means we can better optimise for certain things in our lives. If you’re a coder and want to optimise your productivity. The system might notice that if you get up late, you’re not very productive. So it says your optimal wake-up time is 7:25am, and sets it automatically. If you’re a salesman and you want to optimise sales and making money, the system could learn how what you’re eating affects your sales. Then it could recommend certain diets to help you maximise that. If you’re me, you want to optimise for making other people feel good. So the system could tell you who needs your help, who has the most fun with you, and automatically organise your schedule around that. If you want to optimise to be the happiest you can be, the system could learn what things make you happiest. It could then tell you who you should meet, what you should do and what you should eat. Maybe I’m nuts to think about these kinds of problems. Maybe we don’t all want to optimise for certain things in our lives. But maybe… if we can use computers to find and resolve what limits us as people – we can have a society that is better at getting what it wants.